Pertussis; Oman; Children; Infants; Immunization; Respiratory; Viruses. In Oman, pertussis diagnosis and reporting were based mostly on clinical criteria due to the unavailability of confirmatory tests in most of the health care facilities and technical difficulties with collection of samples and transport. Since 2012, the microbiology labs in the Royal Hospital (RH) and Sultan Qaboos University Hospital (SQUH) have had in-house culture and PCR to diagnose pertussis. This study was conducted to determine the incidence of confirmed pertussis cases within a cohort of children hospitalized for PLI. The study also looked into other potential causes of PLI, severity of disease, and possible predictors of the diagnosis. Children < 13 years of age admitted from 1 January 2012 to 31 December 2013 with the diagnosis of PLI or pertussis in the two tertiary care facilities in Oman (RH and SQUH, both in Muscat) were included. Ethical approval was obtained from both centers. Retrospective data were collected from the electronic patient records of the participants and included patients’ demographics, date of admission, length of stay, duration of symptoms, cough type, history of contact, vaccination status, white blood cell (WBC) count, lymphocyte count, diagnostic tools, complications of the disease, and the outcomes. In both centers, patients with mild to moderate illness were admitted to the general ward, but those requiring close monitoring and assisted oxygenation or noninvasive ventilation were placed in the high dependency unit (HDU). The children with hemodynamic instability or requiring invasive ventilation were admitted to the pediatric intensive care unit (PICU). Admission to the HDU and PICU were considered an indicator of severe illness. For pertussis laboratory diagnosis in both units, pertussis culture and/or PCR were used. Nasopharyngeal alginate swabs tipped in charcoal transport medium and/or aspirates were used. Swabs were inoculated as soon as possible into Charcoal Agar (Oxoid CM0119) with Bordetella Selective Supplement (Oxoid SR0082). Plates were incubated at 35 °C with enhanced humidity. Positive cultures were confirmed by the use of agglutination sera (Remel) to identify Bordetella pertussis and Bordetella parapertussis. Samples were also subjected to multiplex RT-PCR that targeted IS481, IS1001, and ptx A genes. Respiratory samples (nasopharyngeal swabs, throat swabs, or nasal aspirate) were sent in viral transport medium for viruses to detect other pathogens that mimic or are associated with pertussis. Respiratory virus diagnosis was obtained by subjecting the sample to multiplex RT-PCR using respiratory viral panels from fast-track diagnostics for detection of influenza A, influenza A (H1N1), influenza B, coronaviruses NL63, 229E and HKU1, parainfluenza 1, 2 , 3, and 4, human metapneumovirus A and B, rhinovirus, respiratory syncytial A and B, adenovirus, enterovirus, Parechovirus, bocavirus, and mycoplasma pneumonia. The collected data were analyzed using the SPSS Statistics (SPSS Inc. Released 2009. PASW Statistics for Windows, Version 18.0. Chicago). Descriptive analysis was used to describe the demographic and physical characteristics of the patients. The frequency and percentage were used to present the categorical outcome variables, while mean and standard deviation were applied to describe the continuous variables. A confidence interval (CI) of 95% was used to estimate the incidence of pertussis among admitted patients. Further analysis of data was applied by using split variables. The patients were divided into three groups: pertussis positive, pertussis negative, and untested. A chi-square test was used to determine the association between whooping, paroxysmal cough, cyanosis, leukocytosis, lymphocytosis, frequency of vaccination, and pertussis. The leukocyte and lymphocyte count distributions between pertussis positive and pertussis negative patients were compared using the two-tailed Wilcoxon–Mann–Whitney test. The diagnostic performance of lymphocytic count in the prediction of pertussis diagnosis was evaluated using receiver operator characteristic (ROC) curves. The area under the curves (AUROC) and the 95% CI were used as indices of accuracy ROC curve. A total of 131 patients were admitted in both hospitals with the diagnosis of PLI and/or pertussis. This group represents 29.8% (131/439) of the nationally reported cases within same period [Figure 1]. The demographic characteristics of the studied patients are shown in Table 1. The results showed an increase in the admission of infants younger than one-year-old (95.4%), especially those under four months (75.5%). The majority (60.3%) of infants were females. Patients came from five different governorates, but mostly from the Muscat region (61.8%). The vaccination status of two patients in the positive group was unknown, but there were no confirmed infections in those who had completed their vaccinations. 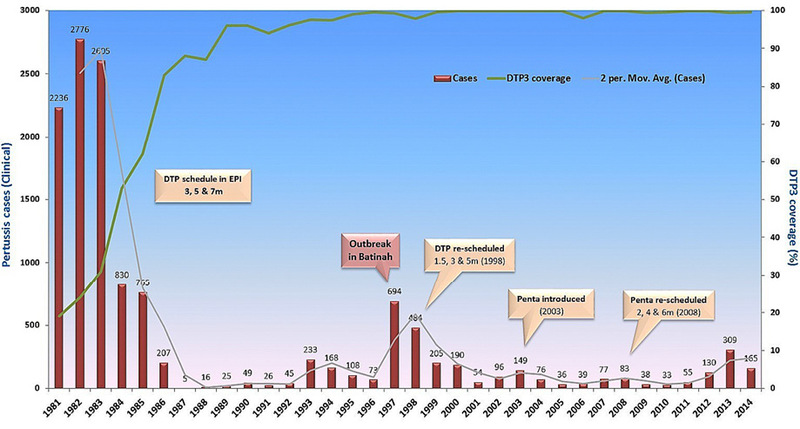 Figure 1: Reported pertussis cases in Oman from 1981 to 2014 and vaccination coverage. Pertussis vaccination with whole-cell diphtheria, tetanus, and pertussis vaccine (DTP) started in 1981 with launch of the Expanded Program of Immunization. A progress decline in passively reported cases to the Ministry of Health were noted with increase vaccination coverage. Outbreaks continued to occur in highly immunized population every 4−5 years. This figure has been reproduced with permission from the communicable Diseases Manual, 3rd edition, 2017, produced by the Directorate General for Disease Surveillance and Control, MOH, Sultanate of Oman. Table 1: Demographic features of 131 included child with pertussis like illness, n (%). No significant difference was observed between the tested cohort of patients (whether proven to be positive for pertussis or not) and the non-tested cohort regarding the clinical diagnostic criteria for pertussis/PLI (paroxysms of cough, whoop, posttussive vomiting, apnea, cyanosis, and fever) or epidemiological linkage contact with laboratory confirmed case of pertussis [Table 2]. Table 2: Clinical and laboratory features of studied cohort, n (%). *Other virus (coronavirus OC43, NL63, HKU1, influenza A and B, bocavirus, parainfluenza 3). PHD: pediatric high dependency; PICU: pediatric intensive care unit; #Fall: From September 23 to December 20; Winter: from December 21 to March 20; Spring: From March 21 to June 21; Summer: From June 21 to September 22.
p-value positive and negative groups. Over half (56.4%) of patients in the study group required admission to the HDU or PICU, and six (8.1%) were confirmed to have pertussis. Only one confirmed pertussis case within the study group was in the PICU compared to three from the pertussis negative cohort, a further five were untested [Table 2]. Most of the admissions for PLI occurred during the summer from 21 June to 22 September (30.5%). For the confirmed pertussis negative group, 38.9% of cases were admitted during the fall (from 23 September to 20 December). Of the 131 patients clinically suspected to have pertussis, 71 (54.1%) were actually tested; 23.9% (17/71) of the tested samples were sent for pertussis culture, 50.7% were sent for PCR (36/71), while 25.3% (18/71) of the patients were tested with both culture and PCR [Table 3]. The incidence of confirmed cases of pertussis infection among patients who were admitted with PLI and were tested for pertussis was 16.9% (12/71; 95% CI 8.2−25.6). Respiratory viral infection was investigated for seven cases of the pertussis positive cohort and 47 of the pertussis negative cohort. A viral etiology was identified in 80.8% (38/47) of the pertussis negative group. The most frequently detected virus in the pertussis positive group was rhinovirus (42.8%) and respiratory syncytial virus (RSV) in the pertussis negative group (31.9%). Both leukocyte and lymphocyte counts were significantly higher in the pertussis positive than the pertussis negative group (23.6±13.3 vs. 12.6±5.2, p = < 0.001 and 16.8±9.7 vs. 7.9±3.8, p < 0.001, respectively) [Table 3]. Table 3: Subgroup analysis for the pertussis-tested cohort. Values expressed as mean±standard deviation. 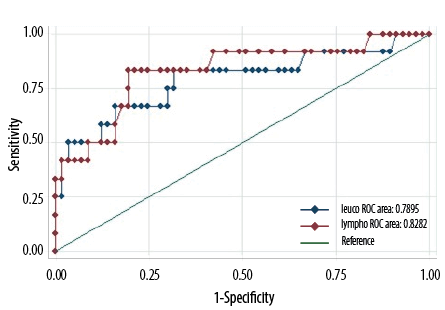 The ROC curve analysis was constructed to obtain the sensitivity and specificity of leukocyte and lymphocyte counts at varying cutoff levels [Figure 2] in detecting true pertussis cases. Figure 2: Receiver operator characteristic (ROC) curve analysis of the diagnostic power of leucocyte (blue) and lymphocyte (red) counts in predicting a pertussis diagnosis. The WBC at a cutoff of 23.5 × 109/L yielded 96.6% specificity and 50.0% sensitivity (AUROC = 0.79, 95% CI: 0.62−0.96). Lymphocyte count at a cutoff 17 × 109/L yielded 98.3% specificity and 41.0% sensitivity (AUROC = 0.82, 95% CI: 0.68−0.97). The current study was conducted at a time when there was worldwide concern regarding increased cases of pertussis.8 At a national level, it was also noticed that the frequency of reported clinical cases of pertussis was on the rise [Figure 1]. The occurrence of apnea, cyanosis, and whooping cough was more common in patients with pertussis while fever, posttussive vomiting, and pneumonia were more common in patients with PLI. However, this was not statistically significant. In a larger cohort, Ferronato et al,18 reported that whooping cough, cyanosis, a leukocyte count > 20 000 cells/mm3, and a lymphocyte count > 10 000 cells/mm3 were significant predictors of pertussis. The limitations of this study are its retrospective nature, small sample size, and the inclusion of inpatients only. Milder cases not requiring hospitalization might have been missed. Another limitation was the relatively high number of patients admitted that were not tested for pertussis. Therefore, some of the variables tested as predictors did not show statistical significance. Taking into consideration that the number of patients tested for pertussis was limited, the incidence of pertussis in the tested patients was 16.9% (12 out of 71 patients). Pertussis remains a clinical diagnosis in our institutions, which makes it hard to detect the true surge of the infection rate. Leukocytosis and lymphocytosis are reliable predictors for the diagnosis of whooping cough. Weisberg SS. Vaccine preventable diseases: current perspectives in historical context, Part II. Dis Mon 2007 Oct;53(10):467-528. 2. Cone TC Jr. Whooping cough is first described as a disease sui generis by Baillou in 1640. Pediatrics 1970 Oct;46(4):522. 3. Munoz FM. Pertussis in infants, children, and adolescents: diagnosis, treatment, and prevention. Semin Pediatr Infect Dis 2006 Jan;17(1):14-19. 4. Mattoo S, Cherry JD. Molecular pathogenesis, epidemiology, and clinical manifestations of respiratory infections due to Bordetella pertussis and other Bordetella subspecies. Clin Microbiol Rev 2005 Apr;18(2):326-382. 5. Shojaei J, Saffar M, Hashemi A, Ghorbani G, Rezai M, Shahmohammadi S. Clinical and laboratory features of pertussis in hospitalized infants with confirmed versus probable pertussis cases. Ann Med Health Sci Res 2014 Nov;4(6):910-914. 6. Hallander HO. Microbiological and serological diagnosis of pertussis. Clin Infect Dis 1999 Jun;28(Suppl 2):S99-S106. 7. Bidet P, Liguori S, De Lauzanne A, Caro V, Lorrot M, Carol A, et al. Real-time PCR measurement of persistence of Bordetella pertussis DNA in nasopharyngeal secretions during antibiotic treatment of young children with pertussis. J Clin Microbiol 2008 Nov;46(11):3636-3638. 8. Cherry JD. Epidemic pertussis in 2012–the resurgence of a vaccine-preventable disease. N Engl J Med 2012 Aug;367(9):785-787. 9. Khamis FA, Al-Kobaisi MF, Al-Areimi WS, Al-Kindi H, Al-Zakwani I. Epidemiology of respiratory virus infections among infants and young children admitted to hospital in Oman. J Med Virol 2012 Aug;84(8):1323-1329. 10. Zouari A, Smaoui H, Brun D, Njamkepo E, Sghaier S, Zouari E, et al. Prevalence of Bordetella pertussis and Bordetella parapertussis infections in Tunisian hospitalized infants: results of a 4-year prospective study. Diagn Microbiol Infect Dis 2012 Apr;72(4):303-317. 11. Jackson DW, Rohani P. Perplexities of pertussis: recent global epidemiological trends and their potential causes. Epidemiol Infect 2014 Apr;142(4):672-684. 12. Johns TL, Roetzheim R, Chen R. Predictors of tetanus-diphtheria- acellular pertussis vaccination among adults receiving tetanus vaccine in the United States: data from the 2008 national health interview survey. J Prim Care Community Health 2013 Apr;4(2):95-100. 13. Surridge J, Segedin ER, Grant CC. Pertussis requiring intensive care. Arch Dis Child 2007 Nov;92(11):970-975. 14. Berger JT, Carcillo JA, Shanley TP, Wessel DL, Clark A, Holubkov R, et al; Eunice Kennedy Shriver National Institute of Child Health and Human Development (NICHD) Collaborative Pediatric Critical Care Research Network (CPCCRN). Critical pertussis illness in children: a multicenter prospective cohort study. Pediatr Crit Care Med 2013 May;14(4):356-365. 15. Guinto-Ocampo H, Bennett JE, Attia MW. Predicting pertussis in infants. Pediatr Emerg Care 2008 Jan;24(1):16-20. 16. Pierce C, Klein N, Peters M. Is leukocytosis a predictor of mortality in severe pertussis infection? Intensive Care Med 2000 Oct;26(10):1512-1514. 17. Murray EL, Nieves D, Bradley JS, Gargas J, Mason WH, Lehman D, et al. Characteristics of Severe Bordetella pertussis Infection Among Infants ≤90 Days of Age Admitted to Pediatric Intensive Care Units-Southern California, September 2009-June 2011. J Pediatric Infect Dis Soc 2013 Mar;2(1):1-6. 18. Ferronato AE, Gilio AE, Vieira SE. Respiratory viral infections in infants with clinically suspected pertussis. J Pediatr (Rio J) 2013 Nov-Dec;89(6):549-553.